There are many recipes out there for making your own cure mix. While it is rare for me to buy prepackaged mixes I am more comfortable when it comes to curing to use an old standby – Morton’s Tender Quick. Around my area, few big chain grocery stores carry it but luckily there is a butcher shop that has a small grocery section that stocks it. I am sure it can also be purchased online. When we got the meat back from the processor it was already frozen. After the pork belly and jowls thawed in the refrigerator it was time to get to work. I have this great big cutting board that I just love because it has a lip on it that drops down in front of the kitchen counter edge to keep it from sliding. When visiting my son in Chicago some years ago, I picked it up at IKEA for around $12.00. I do not know if they still carry them but they are well worth it if you are in need of one. 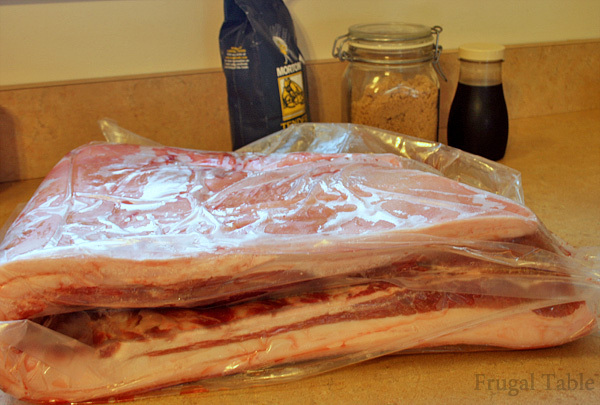 The first thing I do is to rinse, pat dry, and then lay out the pork belly, skin side up and trim the skin off. 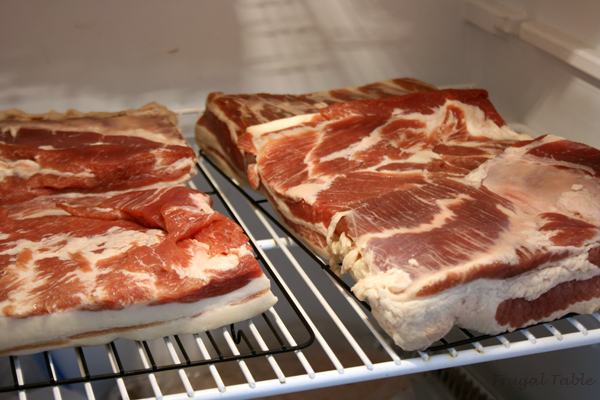 You can either go ahead and cut the belly up into bacon size slabs first or take the skin off first. I tend to cut the belly in half to make it more manageable and then cut the skin off. Pig skin is extremely tough and will dull a knife quickly so I have quite a few handy. Boone is at the ready to sharpen the knives as needed. The trick is to cut close to the underside of the skin because you want to leave enough fat to have nice mix of meat and fat in the bacon slices. Do the same with the jowls if they have skin on them. After the skin is off, it’s time to cut the belly into slabs. I like to cut mine into a rectangle that will fit into the freezer bag. I save any trimmings to cure. Also, I have an electric slicer so I know about how long the rectangle can be to fit on the slicer easily. My slicer is pretty old, about 15 years or so, and I picked it up at one of the big box stores. 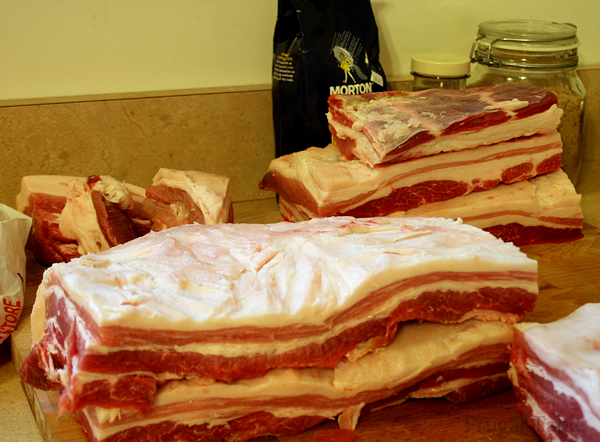 Okay so now I’ve got all of the pork belly skinned, cut and stacked. Time to start the curing process. I have a large plastic container that I do the curing rub part in to help contain the mess. 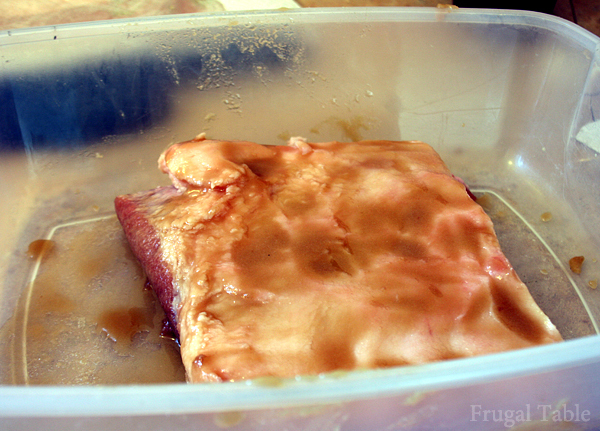 First I set up my curing station with the Tender Quick and brown sugar. There are many recipes online that call for a lot of different spices so it is easy to experiment or straight Tender Quick can be used and is good if flavoring is not desired. First I weigh a slab and put it in the tub. Boone helps out with this part since my hands are going to get pretty messing with rubbing in the cure. He mixes the correct amount of Tender Quick per each slab weight (1 tablespoon per pound), and equal amounts of brown sugar and or maple syrup in a small bowl which I dump over the pork slab and rub it in good all over it; both sides and edges. Place the slab that has been rubbed with the cure mix into the gallon bag and seal. Repeat with all the slabs and any extra pieces that are left from trimming. These can be used to make bacon bits or for flavoring beans, greens, soups, etc. Everything goes into the refrigerator. It takes about 7 days to cure an inch of meat. 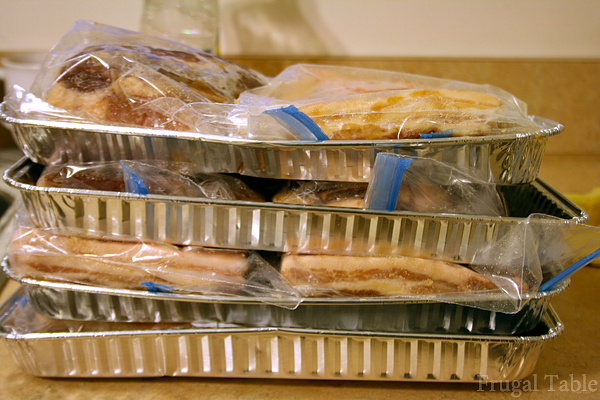 Most of the bacon slabs were an 1 ½ -2 inches thick so I planned on 2 weeks for the cure time. Every day, I flipped the slabs over. The cure mix will start drawing liquid out of the bacon. The liquid will act as a brine to help with the cure. Flipping everyday insures that both sides will cure evenly to the center. After the cure time is up, I take out one of the slabs of bacon, rinse it well and do a fry test. Using my slicer, I slice off a couple of pieces. 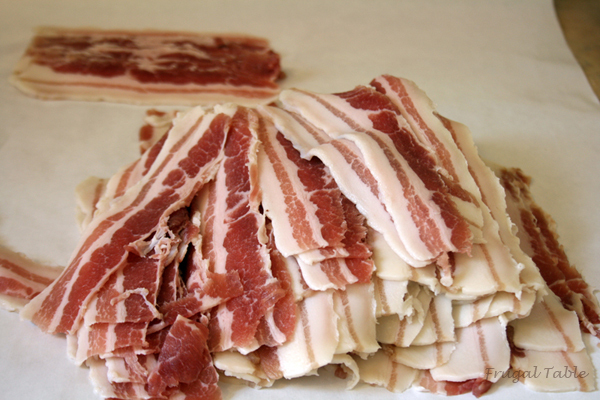 We tend to like our bacon a bit on the thinner side so it will fry up crispy instead of chewy. It had great flavor but burned easily, so I rinsed the slab some more as I think it was the sugar that burnt so easily. After the second rinse it was perfect. I find that I have to cook home-cured bacon at a lower temp than store bought. After rinsing all the slabs, they go back into the refrigerator bare (no bag) to air dry for a couple of days. At that point, the bacon is ready to be frozen or smoked. I keep a few slabs unsmoked so I wrap the slabs individually with plastic wrap, then freezer paper, and then into a labeled freezer bag. When ready to cook, I will partially thaw a slab as it is easier to slice at that point rather than when entirely thawed. More on smoking in the next couple of days!